Gone are days when you have no idea what your baby is doing while you are buried in your work. You’ve got baby monitor apps which let you view live streaming of your sweetheart on your iPhone or Android phone. #1. Free baby monitor apps that work with dedicated baby monitors, like the Reolink C1 Pro. #2. Baby monitoring apps for iPhone, iPad, Android phone, which use your spare phone as the baby monitor and they are generally paid apps. In this post, I’ll list several common baby monitor apps for both iOS and Android devices. You’ll never know how well they can work until you use by yourself. So, download and try these baby monitor apps while you are reading this article. Let’s get started. The baby monitor app is usually free of charge if you get a dedicated baby monitor itself, which is pretty reasonable. And one of the greatest features is the remote viewing via baby monitor app, namely, checking in on your little love nugget anywhere, at any time. Currently, most network baby monitor companies have their own baby monitor apps, which are much more functional and easier to navigate than those baby monitor apps designed to turn your phone into a monitor. Say, if you get the affordable Reolink C1 Pro wireless baby monitor, you can download and install its free Reolink baby monitor app on your iPhone, iPad, Android models. Then wherever you are, you can keep an eye on your loved ones if you have 4G, 3G or WiFi network. While these baby monitor apps only work with certain baby monitor brands, you can access all the security features the baby monitor has with the apps installed, including live view, sending motion alarms, video recording, audio recording, pan/tilt/zoom, and more. Not all parents can afford an excellent baby monitor, especially those sold at a price up to $300 or more. Never mind. If you have an Android or iOS device laying around catching dust, it’s time to make full use of it and turn it into an iOS or Android baby monitor at a low cost, or even free. Step 1: Prepare two phones. One will be your monitoring device; the other will be the “parent station”. Step 2: Download the iPhone or Android compatible baby monitor app on both phones. Step 3: Put the monitoring device at a place where you can see your baby clearly. Step 4: Log into the same account on both devices, you can start watching the live video of your child. To let the iOS/Android baby monitor start working, make sure that the phone used for monitoring is connected to the same WiFi network as the other phone, and is properly plugged into an outlet. Note: Besides mobile baby monitors, smartphones also can be used for other things if you think out of the box. A home security camera is one of them. Click here to learn how to turn iPhone/iPad into a home security camera. There are top 5 baby monitor apps that you can use, as I listed below, if you want to make use of your old phone to build a free baby monitor. Install them on your iPhone 7 Plus/7/SE, iPhone 6s Plus/6/5s/5/4s/4, iPad Pro, iPad Air 2, iPad Air, iPad mini 4, iPad mini 3, iPad mini 2, iPad 4, iPad mini, the New iPad (iPad 3), iPad 2, and iPad, Samsung Galaxy S7/S7 Edge, S6/S6 Edge/ S5/S4/S3, Galaxy Note 5/Note 4/Note 3/Note 2, HTC, Sony, etc. 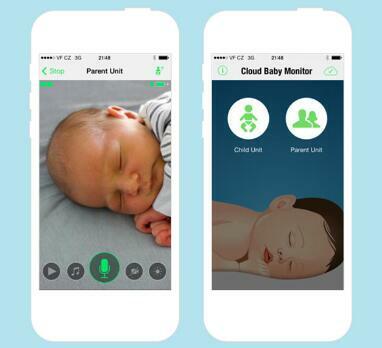 Cloud Baby Monitor is a premium baby monitor app for iPhone, iPad and Mac users. Two iOS devices connect together using WiFi, 4G, 3G, LTE, or Bluetooth, and then you can monitor your kids no matter where you are. See high quality live video of your baby. Hear and talk to your baby no matter where you are. Have a night light and adjust brightness to see your bay through the night. 3 subscription options: Unlimited Range, Multi Child, Multi Parent. Not available to Android users. 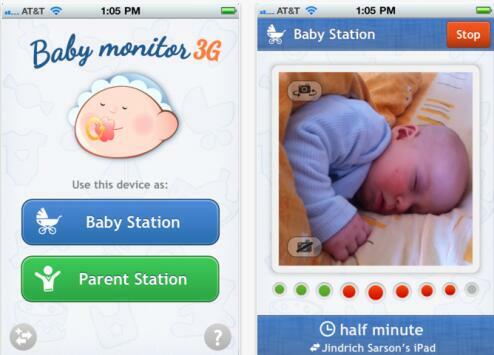 Baby Monitor 3G is a video and audio baby monitor app for your phone, and tablet. It works well with both iOS and Android devices. It works over any network, including WiFi, 3G, LTE. See live streaming of your baby, even in the dark. Hear your baby’s voice and talk to him. The baby station is not allowed to be connected to two or more parent stations simultaneously. 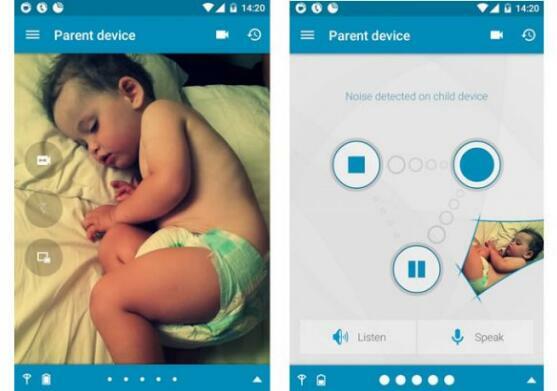 Dormi is a baby monitor app which turns an Android phone or tablet into a baby monitor. It needs two Android devices to work together – one acts as a child device and the other acts as a parent device. Any network connection, including WiFi, 3G, 4G, or even WiFi Direct or HotSpot, is supported. It has a 4 hours of free monthly usage, a monthly unlimited usage at $0.99, an annual unlimited usage at $4.99, and a lifetime unlimited usage at $8.99. An Android-only app, not work with iOS devices. Baby Monitor &Alarm is a kind of user-friendly baby monitoring software for iOS and Android devices. Receive an alert in the form of a phone call if there is noise detected in your baby’s room. Sooth your baby by playing the best music of your kids or a mum’s voice. Can’t see videos of your baby. Fail to talk to your child. Baby Monitor is a free video baby monitoring app, which lets you check on your baby on your iDevices, with a WiFi, 3G or 4G connection. Watch and communicate with your child. Set the sound sensitivity, so that you’ll be informed on your iPhone, iPad if your baby wakes up or moves. Record the video on iCloud directly. Not available for Android devices. This entry was posted in Buyer's Guide and tagged Android phones, apps, baby monitoring, iPhone, phone.